You may be a teacher or aspiring teacher who went to a Title I school yourself. You may be a teacher who wants to find a school that appears to have the “highest need.” You may be a teacher whose closest geographic elementary school happens to be Title I, and you want to know more about it. Whatever pulls you in, teaching in a Title I school is a unique experience. Before making a choice about any school you may wish to teach in, it’s helpful to understand the context of that school. 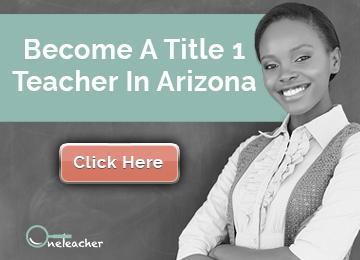 Read on for more information about what it means to be a Title I school and why being a leader or a Title I Teacher in Arizona might be a great fit for you in your career. Just like assuming all first graders are on the same reading level is dangerous for a teacher in making curriculum choices, it’s dangerous to lump all schools of any category together and make assumptions or assertions about the group as a whole. All Title I schools are unique by size, location, student population, teacher population, administration, and a whole host of other factors. When making a choice about what school environment is the best fit for you as a teacher, it’s important to be thorough and serious in your research and understanding of a school, and of yourself. That being said, Title I schools do have certain things in common–they serve children with financial barriers. Title I funding can be used in different ways at different schools. Some schools use it to purchase new technology or curricula for students. Other schools use it to increase healthy options in the cafeteria. It’s common when working in these schools to experience the direct benefits of this extra funding on a day-to-day basis. This is beneficial for kids and teachers, as the school funding at Title I schools is otherwise often much lower than schools in higher-income areas (based on property taxes). An enormous financial benefit for teachers in Title I schools is loan forgiveness. There are a number of programs that may vary by state, district, and even individual schools. This is an enormous help to teachers who deeply care about students in these particular schools. In addition to the federal program, there may be additional assistance according to your specific situation. 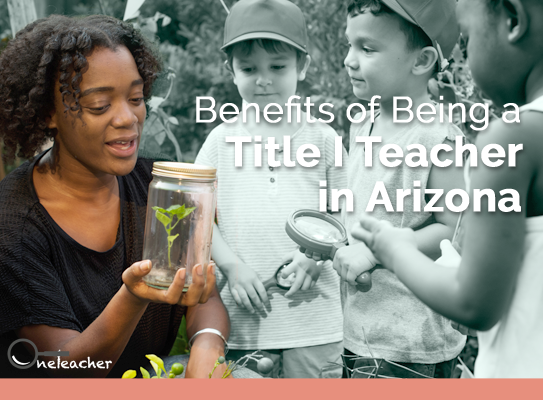 More information about how Title I impacts schools specifically in Arizona can be found here. Another benefit is that teachers who teach at Title I schools begin to form communities focused on how to best serve their students. Teaching in a Title I school is certainly a drastically different situation than teaching at a school with a $20,000 tuition. This means that there are many formal and informal professional networks in which Title I teachers collaborate and create innovative solutions for some challenging educational situations. Title I funding helps students by directly impacting their school’s budget. Title I schools are often colloquially referred to as “free and reduced lunch” or “FRL” schools. This is because Title I funds are connected to students’ eligibility for free lunch programs. (Fun fact: Did you know the Black Panthers were among the first to have widespread national food assistance programs for school children?) As mentioned earlier, each school may choose (or be required) to use their Title I funds in very specific ways. 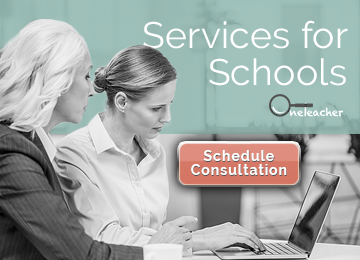 If you’re wondering how a particular school is using their Title I funds, contact the administrative team at the school; they will be able to give you specific information in that regard. In addition to direct funding, many community outreach programs and opportunities may be directly linked to a school’s status as a Title I. For example, the Arizona Science Center offers free field trips to Title I schools. The arts organization Act One also partners with Title I schools to provide assistance for arts-based field trips. There’s a common misconception that Title I also means “low-achieving.” While school funding and family income can be linked to achievement outcomes in some studies or environments, this is not a guarantee. It’s problematic to assume that a student in a Title I school is going to struggle with achievement. In the same breath, no one can ignore the reality that deeply rooted systems of oppression –including those linked to income– have put a disproportionate amount of students in a place where, regardless of skill, academic achievement is significantly harder to attain. Title I teachers are always learning and fighting these systems and must actively work to counteract the negative stereotypes of Title I students. While there are many advantages to working in a Title I school, it has sometimes led teachers into a trap of seeing a narrow benefit (loan forgiveness) as an exclusive reason to join a Title I school team. It’s important to know yourself deeply and to know that on your hardest teaching days you have a core reason for being in the work—a reason rooted in relationships and social justice more than financial well-being. Believing in social and educational justice is critical in these (and all) schools, as income and achievement are deeply connected to the historical oppressions that students in Title I schools still face. Thinking that you have the answers, or leaning on loan forgiveness, will not help you or students in the long run, and may even be damaging. Entering into a profession at a Title I school is a decision that will undoubtedly bring you joy, rage, conflict, and love. There is a critical teacher shortage that begs for highly qualified, highly loving individuals to join our classrooms. To learn more about the experience of being a Title I teacher, check out the stories of Katherine Yabut, Jake Jung, and Oscar Romano. Are you a Title I teacher or thinking about becoming one? What do you think are the benefits of this career choice? Let us know in the comments. We want to hear from you! Title I teaching positions can be very rewarding! OneTeacher is dedicated to matching passionate teachers with achievement-focused Title I schools. Let us help you find the perfect teaching position today! Apply now or give us a call at 602-730-0949 to get started.